Signs of dental disease include bad breath, difficulty eating, loss of teeth, discharge from the mouth, swelling of the areas around the teeth. Bleeding and pain can also be present. Notice the severe dental disease in the mouth of this patient. Regular dental care can help prevent this from occurring. Why does my dog/cat need his or her teeth cleaned and evaluated? Just like you and I, dental care is important for the overall health of your pet. Dogs and cats will benefit from daily at home dental care and from scheduled dental cleaning and evaluation. Dental disease is present in 80% of dogs and 70% of cats by three years of age. Small breed dogs in particular can develop periodontal disease early in life. Chronic dental disease can lead to disease in the heart, liver, or kidneys. It can cause anemia due to chronic disease. It can make your pet less active and cause considerable dental pain. Many pets have enough dental pain to affect their attitude and ability to play normally. Dental disease can lead to tooth loss, gingival infection, tooth root abscesses, and oral pain. What is done during a dental cleaning and evaluation? After the pet is anesthetized, the mouth is examined and all surfaces of the teeth (including the tongue side) are cleaned as well as under the gum line. Each tooth is then probed along the gum line in multiple spots. This helps identify any pockets that may be present indicating dental or periodontal disease. Dental radiographs can be utilized to help look for disease processes below the gum line. Any problems found can be addressed and the condition of the teeth and gums is charted in the record. The teeth are then polished and a plaque barrier gel is applied. Why does my pet have to be anesthetized, can't you do it awake? In order to correctly evaluate the entire mouth, the pet must be anesthetized. Without anesthesia, only a small amount of tartar can be removed, but the entire tooth is not cleaned, nor is the area below the gum line evaluated. The area below the gum line is where the gingivitis and periodontal disease originates. We can not check for pockets or further areas of pain or disease when the pet is awake. Pets will not allow adequate dental probing while awake. Although the teeth may "look better" after a small amount of tartar is removed, there is no improvement in the dental health and disease will continue to progress under the gum line. What do dental radiographs show? Dental radiographs show us the part of the tooth under the gum. It helps show if the root is fractured, if there is bone loss around the tooth, or if there is disease at the tip to the root. Dental radiographs help confirm complete extraction of a tooth to prevent future inflammation and pain. Dental radiographs also help to determine if the tooth can be saved, or if extraction is the best option. These are radiographs of the lower jaw of a dog. 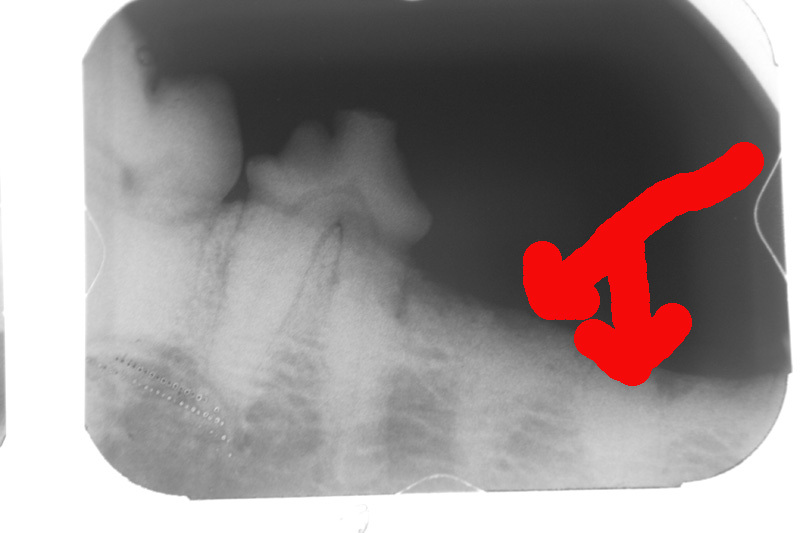 In the first one, the top two arrows point out the horizontal bone loss around the roots of the tooth. Notice how in between the roots, there is a space not filled with bone. The second radiograph shows much more bone between the roots of the teeth and less horizontal bone loss. 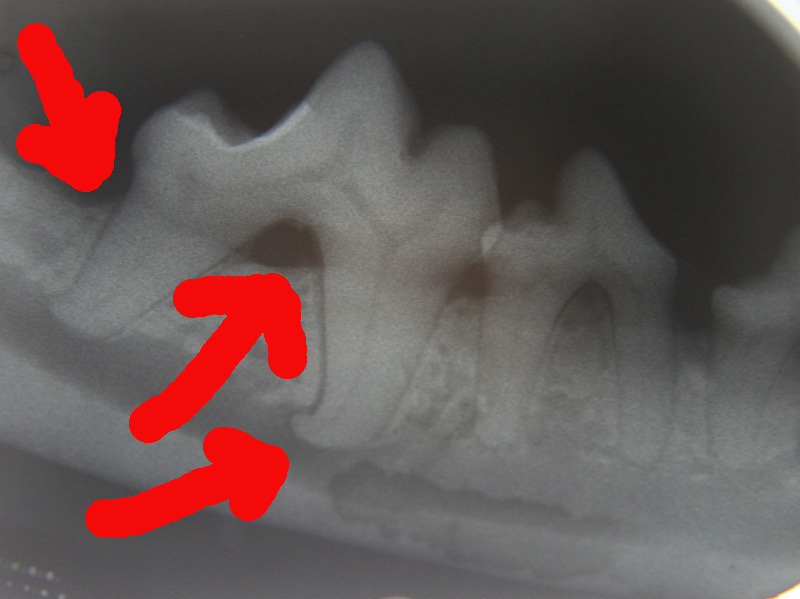 In both pictures, the lower arrow shows the "bent" root of the tooth. Without dental radiographs, if extractions were needed, that bent root would not be known and would likely be broken on extraction. Each of these images show changes that would not be able to be seen without dental radiographs. The first one shows the upper canine tooth of a cat (the "fang"). 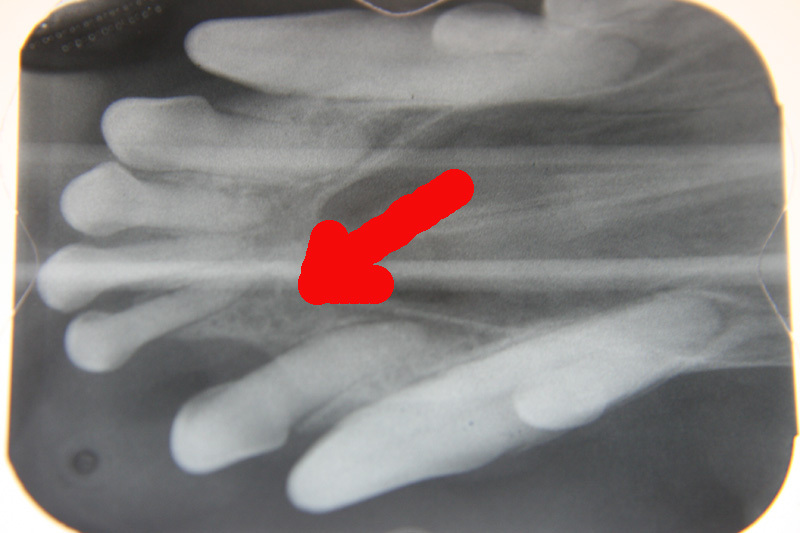 The curved arrow shows a pocket of vertical bone loss while the straight arrow shows a resorptive lesion (similar to a cavity). 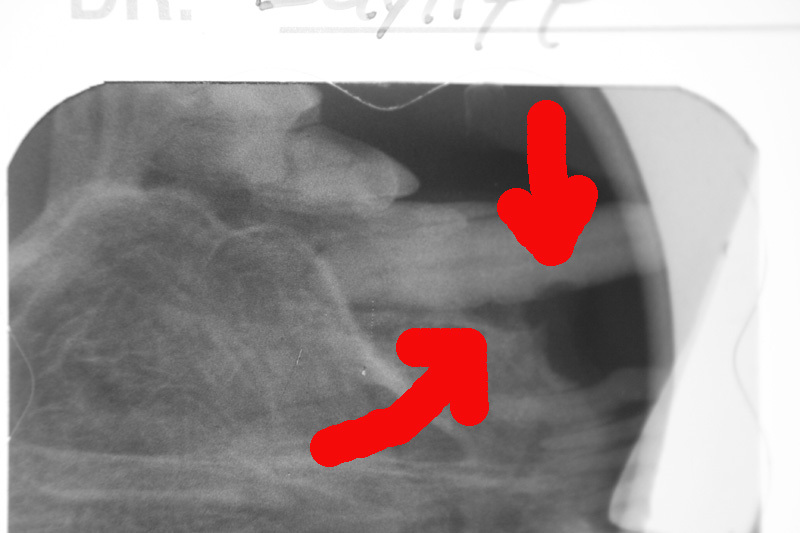 In the second image, an incisor is missing, and the radiograph confirms there is no root left. Retained roots often lead to infections and chronic pain. 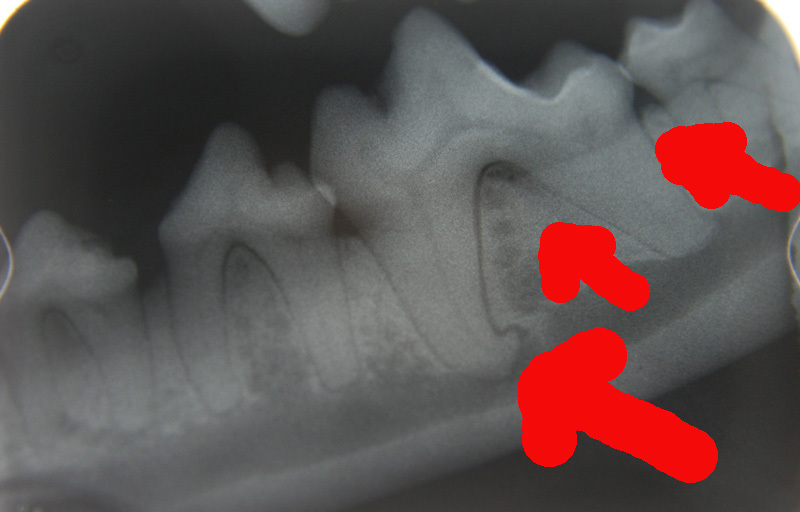 The final image reveals two retained roots on a previously fractured tooth. This allowed identification of the roots and removal was performed.